With 25 years experience servicing the Heavy Industry, providing solutions to highly specialised industries like the Marine and Mining industries is not simply something we do, it's who we are. Metal Products thrives on bringing total solutions to Heavy Industry. 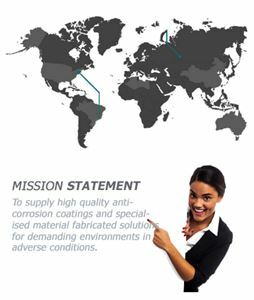 Corrosion Protection is our first division, centred on providing specialized industrial solutions. Unlike other corrosion protection companies in South Africa, Metal Products is the only company licensed to distribute the international product MCU Coatings. MCU Coatings is a unique, high-performance, Moisture Cured Urethane, offering the best protection against corrosion in highly corrosive environments. In heavy industries, such as the ones we service, clients generally use highly corrosive acids in their production process this results in high maintenance costs due to conventional paints failing after just a few months of application, resulting in corroding steel and rust! This is now a thing of the past. With warranties exceeding 5 years, MCU Coatings thrives in these very conditions! Our WHIMS machinery division is truly second to none. As the only company to manufacture WHIMS machines in South Africa! Wet High-Intensity Magnetic Separation Machines are quite simply, a high return solution for separating minerals from the soil using a magnetic process. Every aspect of all our components is 100% South African. Simultaneously, our specialities include refurbishing and supplying spares for WHIMS machines, enhancing their working life. Similarly, we specialise in manufacturing Rotors, components which fit inside the WHIMS, once again, bringing you a proudly South African product. Restoring existing Rotors are once again a forte of ours, improving Rotor working life. Rope Access - a custom alternate access, with incredible benefits for the Heavy Industry, reducing budgets, hence progressing sooner with work. Dredging - removing sediment and debris from rivers, lakes etc. Heat Exchangers - equipment used to efficiently and safely transfer heat from one medium to another. Aluminium Boom Gates and Aluminium Ladders. With the aforementioned in mind, it is clear that Metal Products is a proudly South African company that offers and delivers complete full-house solutions to Heavy Industry. To provide solutions refers to the methods or processes of solving problems. At Metal Products, we endeavour to serve our clients and solve your problems with pioneering and cost-effective technologies. Included in our "solutions" is the globally recognised and sought-after MCU coating. Partnering with the Spain-based owners of this single component, high-performance, Moisture-Cured coating, MCU Coatings South Africa is an incredibly distinctive solution. This market leading product provides excellent resistance against both mechanical ware and corrosion. Formulated as single component moisture-cured Urethanes and as the leading anti-corrosive coating on the market, it is created to thrive in the most extreme weather conditions. Created to be applied to damp surfaces, at temperatures ranging from as low as -12 °C to ±80 °C, MCU coatings can withstand humidity levels between 6% and 99%. MCU coatings are clearly designed with all our Heavy Industry clients in mind. Both Innovative and cost-saving, MCU coating have increased productivity by up to 60%. Clients in the Heavy Industry tend to utilise highly corrosive acids in their production process. Our paint comes with warranties exceeding 5 years (depending on the environment of exposure) and is the only anti-corrosive solution you will need. Furthering our vision of providing innovative solutions which are cost effective is our Rope Access solution. Rope Access is an alternative access solution to scaffolding and is constructed on a lower cost model which holds fast to all the aspects of Occupational Health and Safety. Rope Access from Metal Products has been proved to reduce scaffolding budgets from between 20%-45%. One of the significant benefits of rope access provides clients with both the contracting aspect as well as the required access, reducing costs for our clients. Rope systems remove operational and time constraints as they're quick to install as well as dismantle. Simultaneously, they require fewer men than and may eliminate the need for road closures and / or track possessions, providing even further cost savings. This unobtrusive solution is ideal for any clients that need to adhere to their visual integrity, such as hotels, during maintenance or inspections. Equally significant is the point that unlike with scaffolding, disruption at ground-level is greatly curbed, allowing for the continuation of other trades. Likewise, Rope Access may also work to forge ahead earlier, diminishing structural damage. Metal Products is your one-stop full-house solution to any requirement in the Heavy Industry! Something we're particularly proud of is that every aspect of WHIMS machines (Wet High-Intensity Magnetic Separators) is South African. Locally manufactured, opting for our machines is a smart move as it has proved to lower operating costs between 25%-40%. Our dynamic WHIMS machine is the ground-breaking product of our technical team coupled with an excellent working relationship with our suppliers. This unique pairing of our technical team and suppliers has resulted in enhanced mineral separation. Particularly exhilarating results have come to the fore in which excellent separation and high rates of recovery as well as the extended working life of the components have come about due to the novel modifications. There is no doubt therefore lower operating costs are a consequence of utilising our WHIMS machine. Similarly, the Rotors which fit inside the WHIMS are manufactured by us and yes, these too are South African to the core. To delve into the technical aspects for a moment, the production of the salient plates includes high grade magnetic stainless steel. The inclusion hereof has led to the reduction of pitting and operational blockages-excellent news for any client. 20 ton/hour narrow rotor for 16 pole machines. 40 ton/hour wide rotor for 16 pole machines. 10 ton/hour narrow rotor for 8 pole machines. Due to the products we utilise, Rotor life has already been extended prior to salient plate replacement is actually required. These magnets have been in operation for over 10 years without being replaced or refurbished. Magnet core temperatures have been known to exceed 150 0C, without the magnet failing. Efficient internal cooling fins inside the magnet canister ensure that the magnets are kept at low temperatures at higher amperages. Due to the large Boil Box Screens, feed blockages have been reduced and cleaning frequencies minimised. But we don't stop at manufacturing magnificent machinery and components, we also refurbish existing WHIMS and Rotors; refurbish and repaint all mild steel components; replace feed system; supply new oil cooling system and so much more. Quite simply we're the only stop you need to make in for complete solutions for the Heavy Industry.